The Sabre was used by the military. A lighter, more flexible version of the military sabre and hits can be scored by using edge ‘cuts’ or point thrusts. Only, hits scored on the opponent’s body above the waist, arm and head count as valid. Points are scored by the fencer who hits the target area and has “right of attack”. THE HISTORY OF THE SABRE! The first mention of the sabre in print is in Marcelli’s manual (1686). Originally the heavy, curved, weapon with which the Household Calvary is still equipped, it became known to western Europe during the eighteenth century as a result of contact with the Hungarian light horsemen (Hussars) who had themselves adopted the weapon from the Turks, among whom the blade was considerably more curved, forming, in fact, the weapon common to the eastern peoples which among us is generally called the scimitar. In the eighteenth and early nineteenth centuries, the cavalry of all nations practised sabre fencing and fighting. In the eighteenth century the small-sword was regarded as essentially the gentlemen’s weapon and from association with it, the foil enjoyed much the same prestige; the sabre was considered to be a rather crude affair for the military. The Napoleanic Wars aroused a passing enthusiasm for edged weapons, but this quickly faded again. George Roland poured scorn on the sabre and most traditionally minded foilists affected to regard it with disdain. Only at the nineteenth century’s end did such great Italian Masters as Radaelli and Magrini confer respectability on their chosen weapon, since when it has gained steadily in popularity. The present day weapon is extremely light and hits may be scored not only with the fore-edge, but with the top third of the back edge and the point as well. The contemporary blade is perfectly straight, but within the writer’s memory, many still possessed a vestigial curve which, according to the rules, might not deviate more than 4 cm from the straight line. The curved, triangular guard, reminiscent of the old basket-hilt, must now be absolutely smooth; formerly, it was often perforated, grooved, patterned or embossed. The technique of the cut has traditionally been the subject of controversy and has undergone sundry vicissitudes over the years. The military men delivered the cut with a forearm slash from the elbow, or even the shoulder. The great Keresztessy of Budapest, however, preferred the use of the wrist. That was in the 1820s, but when Barbasetti arrived from Italy at the century’s end to take charge of the Austrian Army, he insisted on a return to the forearm method, a retrograde step, but consistent with the contemporary principles of his own country. It was left to Santelli, another Italian expatriate, to introduce in Hungary the classical wrist-finger technique regarded as characteristic of that nation and now almost universally copied. Modern sabre fencing has rules and conventions similar to those of foil; they were framed in Paris in 1914 by a committee under the chairmanship of Dr. Bela Nagy, president of the Hungarian Fencing Federation, and since then have only been modified in detail. A development of the duelling rapier, this weapon is used in the Modern Pentathlon. A heavier thrusting sword and valid hits can be scored with the point of the weapon on any part of the opponent’s body, including the head. Points are scored by being the first to hit anywhere, anyhow, anytime, just FIRST! The duelling sword evolved during the nineteenth century when the small-sword had ceased to be worn. It is the same length as the foil and sabre, but the blade is much stouter than that of the foil, is triangular in section and the forte is fluted, i.e. grooved, to allow the blood to drain away. As the target includes the whole body, the guard is constructed in the characteristic cup shape to protect the hand and wrist. As the arm forms an advanced target, the fencing measure is much longer than that at foil – approximating in fact to the sabre measure – and the vulnerability of the sword-arm tends to restrict the positions and parries to the outside lines. Nevertheless, the basic epee technique is very similar to that of foil, only modified by the tactical considerations dictated by the longer fencing measure, the unrestricted target and the absence of conventions, i.e. right of way. 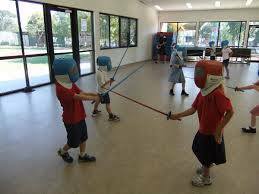 Originally, the idea was to reproduce as closely as possible the conditions of an actual duel and consequently the first fencer to receive a hit was adjudged the loser. Subsequently, the number of hits was increased, first to the best of five in 1932, finally to the best of nine in 1955, similarly to the other weapons and accordingly somewhat reducing the realism. In pursuance of verisimilitude, moreover, the majority of epee competitions took place in the open air; not until 1937 was the British Championship held indoors at Salle Bertrand. 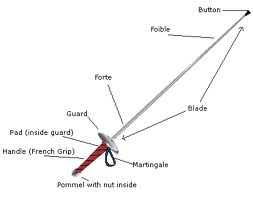 The epee was the first weapon to be electrified, with a spring-head in place of the point d’arret (triple barged flat head) previously used to cover the sharp point left exposed when duelling. The rules for epee, like those of foil and sabre, were more or less definitively framed in Paris in 1914, by codifying the several existing sets of laws. The Foil was used for resolving matters of honour. A light, flexible weapon with which only thrusts with the point of the weapon to the opponent’s trunk of body count as valid hits. 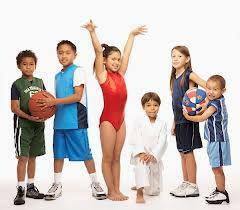 Hits count on the abdomen, chest and back but not on the the arms, legs and head. Points are scored by the fencer who hits the target area and has “right of attack“.